It was a devastating story that took out one of the most powerful men in Hollywood in a matter of days and exposed an entire industry’s complicity in his sexual perversions, but it didn’t come from a major news network, organization, or famous journalist, it came from a mildly popular magazine and a reporter more famous for who his parents are than his reporting. That reporter, Ronan Farrow, and that magazine, The New Yorker, struck again Tuesday, this time exposing the most powerful state Attorney General in the country, causing his resignation in disgrace in a matter of hours. But more than exposing hypocritical Democrats as the misogynistic monsters they are, these stories and their aftermaths exposed just how incestuous and complicit the mainstream media is in all of it. Part of the answer can be found in Farrow’s story exposing Schneiderman. 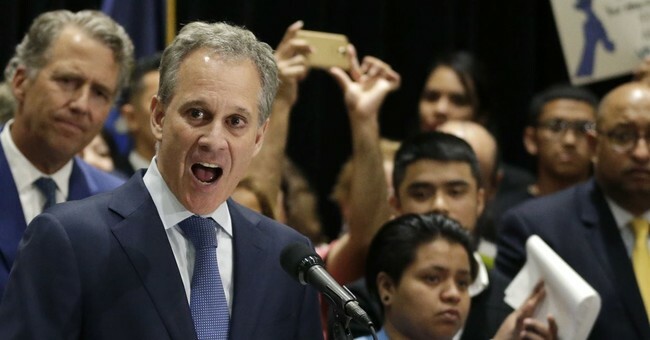 Yes, as a “leader of the #Resistance,” Schneiderman had made quite a name for himself in the Democratic Party. Plans were already being discussed for higher office. A lot of hopes were hung on his shoulders that he would find ways not only to damage President Donald Trump’s agenda by suing over nearly every action his administration took, but by pursuing state charges against as many Trump associates and family members as possible. A presidential pardon might cover federal charges, but they can’t do anything against state charges, liberals routinely smirked. The world in which Schneiderman and Weinstein operated is small, people don’t move into or out of it with regularity. Dating in insulated, powerful circles means people tend to know much of the business of others. To put it another way, people talk. That’s how rumors spread. So how is it that no one in the media heard anything about either of these men until their stories were reported? How was it “news to them”? It is, after all, the jobs of these people to observe, to gain information, then disseminate that information to the public, particularly information about the powerful and politicians. The reason is rather simple, and it’s one of the main complaints about the White House Correspondents’ Dinner – that the media elite are too close, too friendly with the people they cover, specifically liberal politicians, to cover them honestly. Even if they were only acquaintances, no one wants to be the skunk at the garden party. Operating in the same social circles pollutes the relationship between journalist and politician, even when they agree politically. That means rumors are ignored or laughed off, no matter how many times they’re heard or their source. It’s highly unlikely the people on cable news who clutched their pearls over Farrow’s stories were doing it because they were blindsided by the allegations, but more likely they were shocked someone reported them. How many more secrets are they concealing because of their friendships? How many more monsters walk among them, protected because they’re “on the team”?